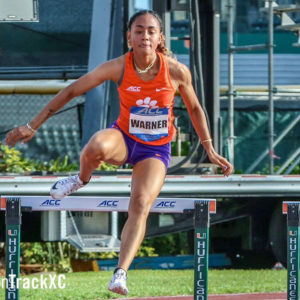 Over coming injuries and frustration that curtailed her indoor season, then harbored thoughts of quitting on the outdoor campaign after a very bad start, Clemson sophomore Lakeisha “Mimi” Warner, clawed hew way back to earn a silver medal in the Atlantic Coast Conference Outdoor Track and Field Championships 400m hurdles in Coral Gables, Florida, on Saturday evening. 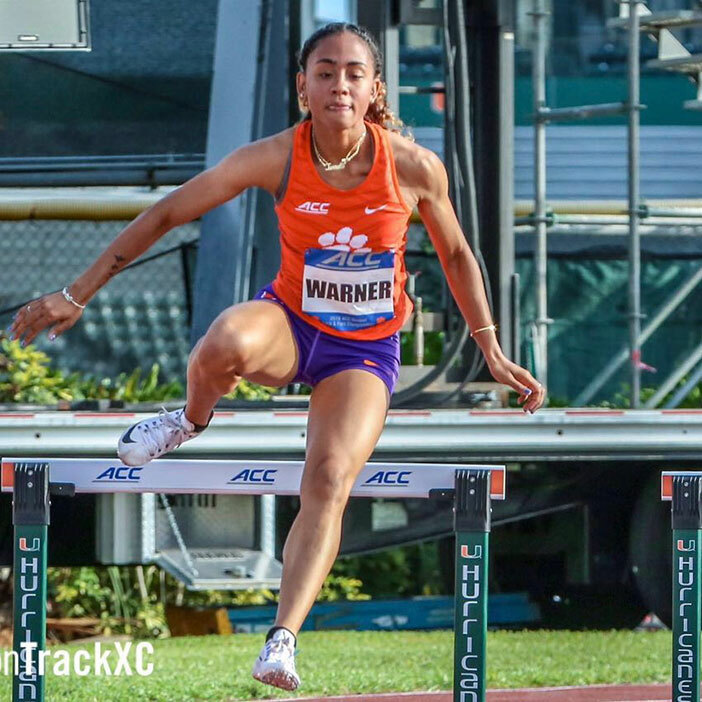 In the process, Warner improved her own national and OECS record of 57.76 seconds, after stopping the clock at 57.23, a mark that places her at No 5 on the Clemson All Time List and No 12 on the 2018 NCAA Collegiate List, after Super Conferences weekend. Warner signaled her intention to contend for the title, when she posted a time of 57.80 seconds to win her heat, with the fastest time of the prelims. Warner noted that the Miami runners went out hard and remembered they were on a different race model and refocused on her race. She said once she got off the seventh hurdle, she saw she was in medal contention. “I was like ‘Lord, please help me finish’ and I hit the 10th hurdle and said ‘Lord, please help me finish, I’m almost there only 40 meters left to go’ and I used whatever I had left and I finished,” she explained. Warner struggled with an Achilles injury that hampered her indoor season. Frustrated, she spoke to her dad, who advised her to focus on outdoors as she couldn’t run indoors. She spoke to her mentor Natoya Goule of Jamaica who advised her to pray and not be distracted. After her 57.80 seconds prelim, Warner said it showed her that she was capable of doing something great. After running 57.76 at LSU, she was told she’s not a 57 hurdler as she had to do it more than once. Warner advanced to the May 24-26, NCAA East Regional Prelims in Tampa, Florida, where her focus is one race at a time. At the Bermuda Invitational, Ashley Kelly finished sixth in the 400-meters with at time of 55.62 seconds. She was also sixth in the 200-meters in 25.00. Representing St. Vincent Pallotto High School in the Maryland Interscholastic Athletics Association Private Schools Championships B Division, Trent Herbert had a personal best leap of 6.13-meters (21 feet 0½”) to win the long jump a part of a trio of top three finishes. He was third in the 100-meters in 11.36 seconds after running 11.41 to advance. Herbert ran a 400-meters personal best of 50.86 seconds, while finishing second. He advanced to the final, after recording a time of 52.16 in winning his heat.